A beautiful Claddagh pendant and chain made from sterling silver. This lovely pendant features a celtic weave which flows down into the Trinity Knot embossed cuffs. The hands hold a clear cubic zirconia pave set heart with a beautifully detailed crown above. This fabulous pendant is the perfect addition to your Irish jewellery collection. The Claddagh symbol represents love - the heart, loyalty - the crown and friendship - the hands. 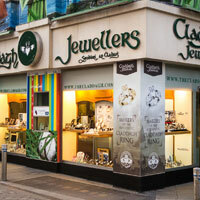 The Claddagh is often given to a loved one as a sign of your love to them. 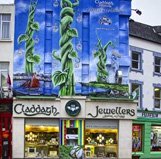 Claddagh Jewellers - The Celtic Jewellery Specialists - From Galway with Love!